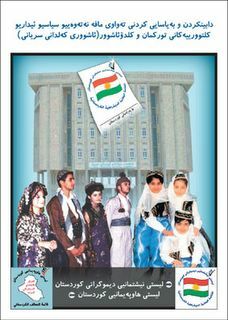 This Kurdistan poster says “Legalising Turkomans, Assyrians, Chaldeans full political and cultural and ethnical rights” . It is one of many displayed at Kurdo’s World where he gives you a peek at happenings in Kurdistan. There are some other beautiful Kurdistan posters shown there and some photos of Kurds crossing the snow covered roads to get to a voting station. The Chaldeans are an Iraqi Christian minority group and have a significant population in the Detroit area. This poster shows how important it is for the minorities to vote and be represented in the new government. This would have been a pipe dream for these Iraqi minorities just a short time ago.